In March 2019, Rukmini Banerjee (President of HasNa) traveled to Nepal to attend the South Asian Regional Institute for the Study and Practice of Strategic Nonviolent Action organized by the International Center on Nonviolent Conflict, Center for Social Change, National Network for the Families of the Disappeared, and Department of Conflict, Peace, and Development Studies, Tribhuvan University. During a field visit that was part of the training, Rukmini had the opportunity to meet and interact with 10 members of the Discharged People’s Liberation Army of Nepal (DPLAN). For the last 9 years, 4,008 former combatants (Verified Minors and Late Recruits) of the People’s Liberation Army have been trying to make their demands heard through the use of dozens of nonviolent civil resistance tactics, and yet their demand for reparations packages including financial aid and a public apology from the Maoist party[i] have been consistently ignored by both the government and their former party. With no educational qualifications or vocational training, and no formal reintegration program provided by the Nepalese government, an entire sub-section of Nepalese youth lies at risk of getting re-radicalized, thus leading to a major setback in Nepal’s peace process. Following the Comprehensive Peace Agreement signed on November 21, 2006, between the Nepalese Government and the Communist Party of Nepal – Maoist (CPN-M) at the end of the civil war, the United Nations responded to a request for assistance with the formation of a political mission named United Nations Mission in Nepal (UNMIN). Formed on January 23, 2007, UNMIN’s role was to monitor the disarmament and demobilization of the Maoist army, and reintegration of armed personnel of both the Nepal and the Maoist armies – assisting in the monitoring of ceasefire agreements, and providing technical assistance for the Constituent Assembly (UN Security Council Report, 2010). Between January and February 2007, the UN verified the ages and recruitment of 31,318 Maoist army personnel in cantonments. [ii] During the second phase of the registration process conducted between June and December 2007, the UN verified the ages and dates of recruitment of all personnel in the cantonment. By December 23, 2008, the UN had completed the verification of 4,008 individuals: 2,973 were assessed to be minors, i.e. under the age of 18 years on May 26, 2006, and 1,035 were assessed to have been late recruits, i.e. recruited after that date. [iii] As a result, the 4,008 ex-combatants were disqualified for being Verified Minors and Late Recruits (VMLRs), making them ineligible for the same benefits as former full-time combatants of the People’s Liberation Army (PLA). For almost three years after the Peace Agreement was signed, the disqualified PLA members remained in the camps where they continued to engage in manual labor and construction work. Finally, when the Peace Agreement was implemented in 2008, these disqualified members were forced to leave the camps with only one month’s salary (NPR 10,000-12,000) each. For them, this was a disgraceful exit. For almost a year after being discharged, the VMLRs continued to ask their party leaders for better reintegration programs. Their primary demand was to be given respect and some sense of identity. They called for the immediate removal of the ayogya or `disqualified’ label, as it was fast becoming a derogatory term among local communities, implying that they were “useless or “incapable”(IRIN). When their concerns were continually ignored by the party leaders, they decided to organize themselves as DPLAN in 2011. Since 2011, the discharged PLA members have deployed dozens of nonviolent civil resistance tactics, some of which have been recorded in a booklet published by them. They still believe that nonviolent civil resistance is the best way to negotiate with the government because they don’t want to harm innocent people by resorting to violent means. They have organized sit-ins and hunger strikes, displayed black flags of protest against the government and non-governmental stakeholders. They also hosted conferences and seminars and observed silent protests during which they tied black strips of cloth over their mouths. The women organized sit-ins with their children and also blew whistles in protest. One of the more innovative tactics was conducting a “smile movement” wherein the organizers met all the leaders of the party and simply smiled at them, without speaking a word. They declared January 25 as a ‘Black Day’ as that was the day they were discharged from the camps. Even though their struggles have been peaceful, the Nepalese government has not backed down from using force on them. Many ex-combatants were arrested and wrongful charges pressed against them. One of the female ex-combatants claimed to have been arrested twice, once with her child. “I expected female security forces to arrest me during the civil resistance movement. But that did not happen,” she said. The Verified Minors and Late Recruits did not have access to either the cash or the integration options and were ultimately released from the cantonments in 2010. With the Maoists struggling to retain command and control over the remaining former combatants, responsibility for the cantonments was handed over to the state, and by October 2012, all the cantonments had been vacated and closed. The UNMIN withdrew from Nepal in 2011 and while legitimate concerns were raised by the international community over the short-term nature of the cash payouts and the dissatisfaction of the former combatants, the government was too caught up in the challenges posed by the transition process to pay much attention to the needs of the relatively smaller group of disqualified ex-combatants. Due to flaws in the legislation setting up the transitional justice mechanisms, the international community also gradually withdrew support from the Truth and Reconciliation Commission (TRC) and the Commission of Investigation on Enforced Disappeared Persons (CIEDP), beginning in 2014. [vi] Thus, as a result of the faltering transition process, withdrawal of the international community, and the subsequent earthquake in 2015 that caused inconceivable damage to the country’s infrastructure, the demands put forward by DPLAN over the last 9 years failed to become a priority for the Nepalese government. The DPLAN members believe that there is some glory in their past, but lately their work has been criminalized. They are seen as problems, rather than solutions. “We are disqualified or deemed to be ‘ayogya’: we have not received any recognition. The causes that we fought for were established as well as institutionalized. But the fighters for the cause were called disqualified and thrown out of the camps,” said Comrade Karan (name changed), a member of the DPLAN core organizing committee. Not only have they been in many cases, rejected by their communities, but they also feel rejected by the party that recruited them. According to the UN, ‘reintegration’ is defined as the process by which ex-combatants acquire civilian status and gain sustainable employment and income. Reintegration is essentially a social and economic process with an open time frame, primarily taking place in communities at the local level. It is part of the general development of a country and a national responsibility and often necessitates long-term external assistance. [vii] Denying these benefits and services to the youth and ignoring their demands might lead to a fresh bout of insurgency, especially as their patience runs thin. This poses a threat to the stability and overall development of the country, and can derail peacebuilding efforts of the past 13 years. On DPLAN’s part, the 4,008 ex-combatants must identify their role within the changed political landscape of Nepal and approach the government (and Maoist party) with more specific demands pertaining to their own role as an important actor in the post-conflict reconstruction and transition process. 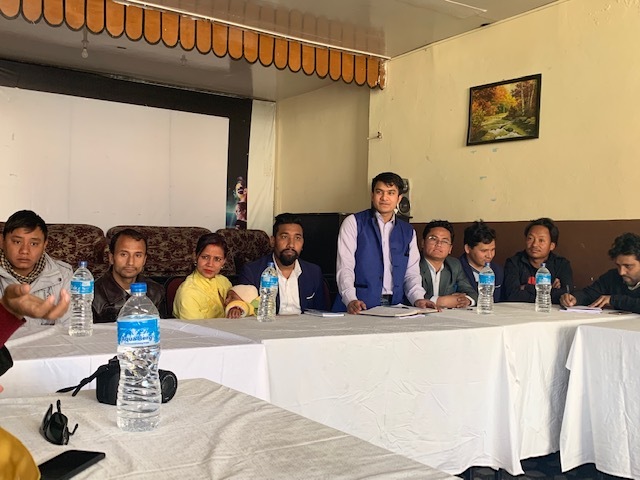 Furthermore, they should engage in dialogue and negotiation with the government to formulate a specific, measurable, achievable, relevant, and time-bound (S.M.A.R.T) response strategy that will hold both parties (Nepalese government and DPLAN) accountable. They can also approach local/regional civil society organizations to seek help regarding human development programs. And finally, the ex-combatants should strengthen their commitment to nonviolent tactics in order to ensure the stability of Nepal’s peace process. In addition, the international community must renew its commitment to strengthen Nepal’s peace process by channeling resources to supplement government efforts and meet the most recent needs of the disenfranchised group. International donors must invest in the formation of truth and reconciliation commissions that will facilitate dialogue and negotiation between the government, the Maoist party, and the disqualified ex-combatants. Moreover, the UN should reassess the ‘disqualified’ label attached to their identity and come up with a more acceptable epithet that will help the ex-combatants rebuild their identity and sense of self-worth. A lot of literature exists on best practices and lessons learned from relatively successful Disarmament, Demobilization, and Reintegration (DDR) programs such as that of Sierra Leone and Central African Republic (CAR). While the historical contexts and the number of targeted youth obviously differ from country to country, some of the reintegration methods may be applied to multiple scenarios. At the end of the day, the government of Nepal needs to recognize that without a robust reintegration program for disenfranchised youth, the coveted digo shanti or sustainable peace will be difficult to accomplish. [vii] World Bank, ‘Disarmament, Demobilization, Reintegration’, Social Development Department: Conflict, Crime, and Violence, No. 119/ February 2009, p.5. URL: http://siteresources.worldbank.org/EXTSOCIALDEVELOPMENT/Resources/244362-1164107274725/DDRFinal3-print.pdf, accessed April 1, 2019.